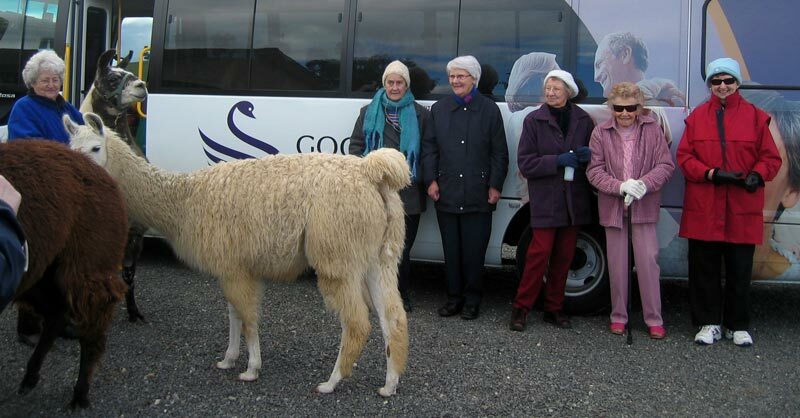 Have a coach or large group and want to visit Alpaca Magic? Alpaca Magic is 20 minutes north of Canberra. There is a tar road to the gate and a good all weather gravel road to the house. Good turning circle and parking for buses and cars. Easy walking and short distances to meet the animals. The animals are gentle, quiet and friendly. Covered area if you would like to bring your own refreshments. Tables, chairs and urn available by request. We can design a guided tour to your requirements. Please express your interest. Meet the alpacas, llamas and donkeys, Miniature Galloway Cattle,and their babies. See the Japanese Koi Carp and the waterfall garden. Show and tell about alpaca and llama fibre, spinning, felting and needle felting, video (15 minutes) about alpacas, try your hand at spinning. Please bring: Sensible clothing, closed toe shoes, hat, sunscreen, camera. Merchandise: We sell 100% alpaca – natural coloured raw, processed fibre and knitting yarn. We also have hand dyed fibre, felting kits and some other merchandise. We do not sell clothing.